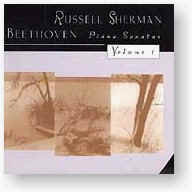 Volume 1 of Russell Sherman’s bold and controversial vision of the Beethoven Piano Sonatas. [All thirty-two sonatas are being recorded and released by GM Recordings as five double-CD sets.] This album and Volume 2 (GM 2053) have generated enormous amounts of press, controversy and praise, being selected along the way as Stereo Review’s ‘Pick of the Month’ and one of the Boston Globe’s Top Ten Classical Releases of the Year in 1996 and 1997. Also available in the series is Volume 3 (GM 2057). Recorded on 27-30 December 1993 and 27-30 December 1994 at the Campion Center in Weston, Massachusetts.